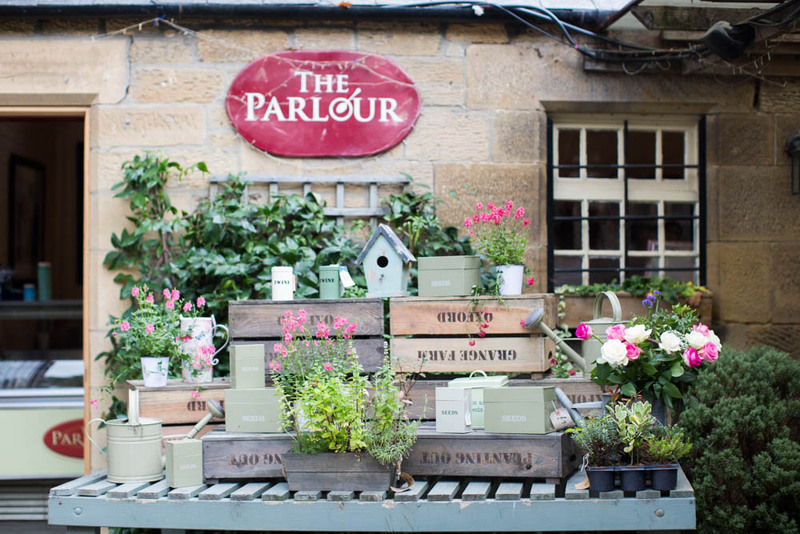 We got married at the Blagdon Parlour, a beautiful tea room and ice-cream parlour on the Newcastle/Northumberland boarder. We fell in love with it from the moment we saw it and everyone would definitely agree that it is very "us". My Dad drove me the few miles from St Mary's Inn to the Parlour and we spent our journey chatting about anything and everything to keep my mind from what was about to happen. I didn't want to think too hard about what was waiting for me at the other end, fearing that emotions would take over and my beautifully applied makeup would end up down my face. I arrived at the Parlour to be greeted by my team of Bridesmaids, all ready to help me out of the car and rearrange my dress. Walking down the path to meet with the Northumberland Registrars, I was feeling cool and confident with my team of ladies behind me. I never thought I'd make it this far with no tears! 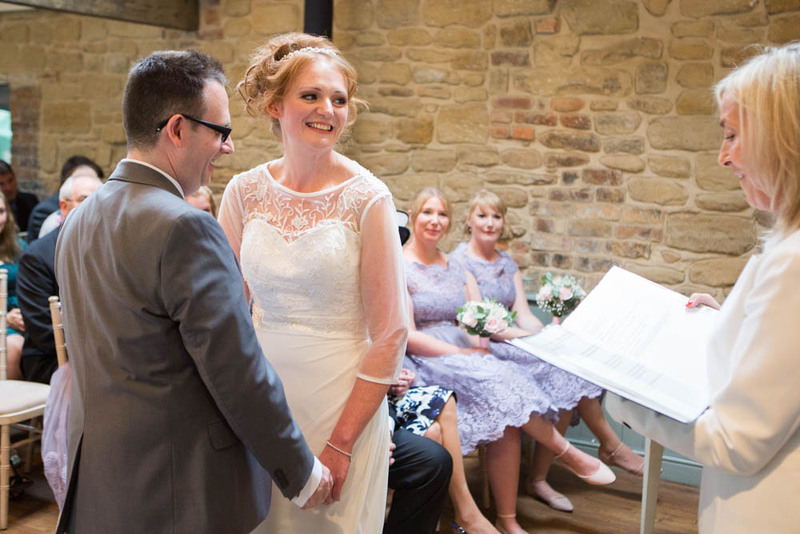 I had arrived bang on time and a few moments later I was ready to walk down the aisle. 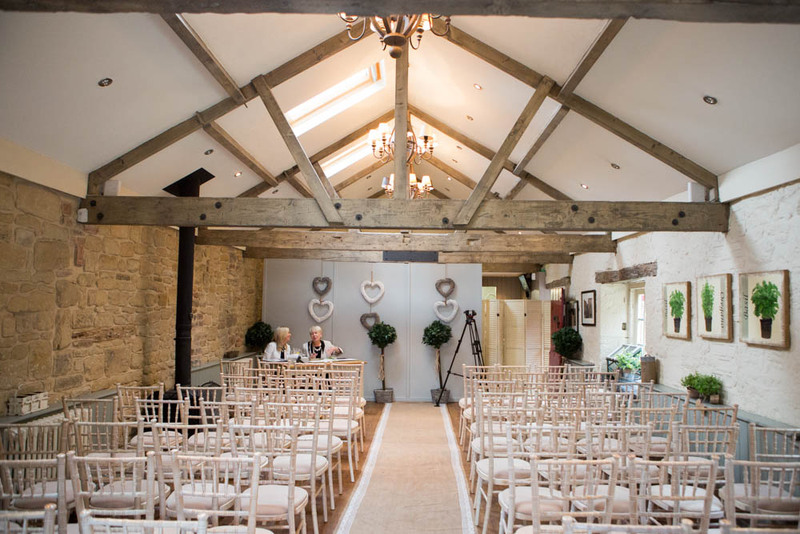 Our ceremony took place in the tea room which had been magically transformed into the perfect wedding venue. It's hard to believe that only a few hours later the place would have been filled with people tucking into their cakes and now it was full of our friends and family. 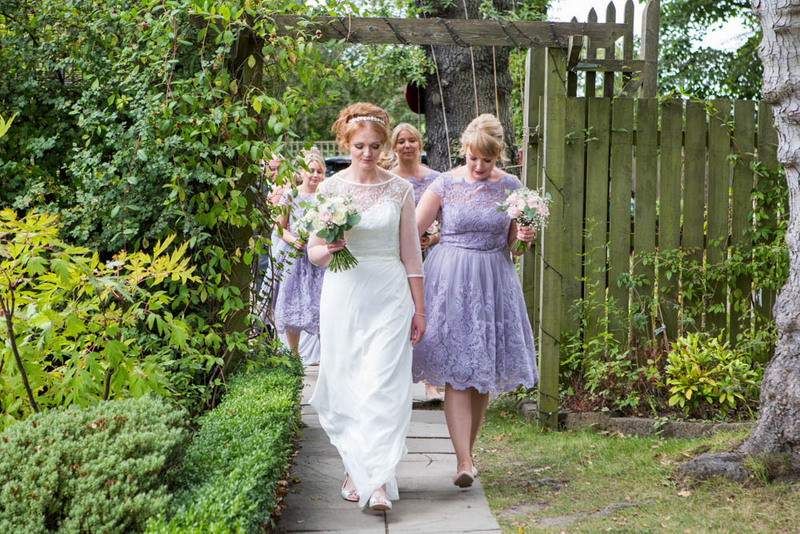 We chose "I'm Gonna Be (500 Miles) by Sleeping at Last as the bride's entrance song, a funny choice as I hate the original by the Proclaimers but this version was truly beautiful and I had never realised before how perfect the words are. 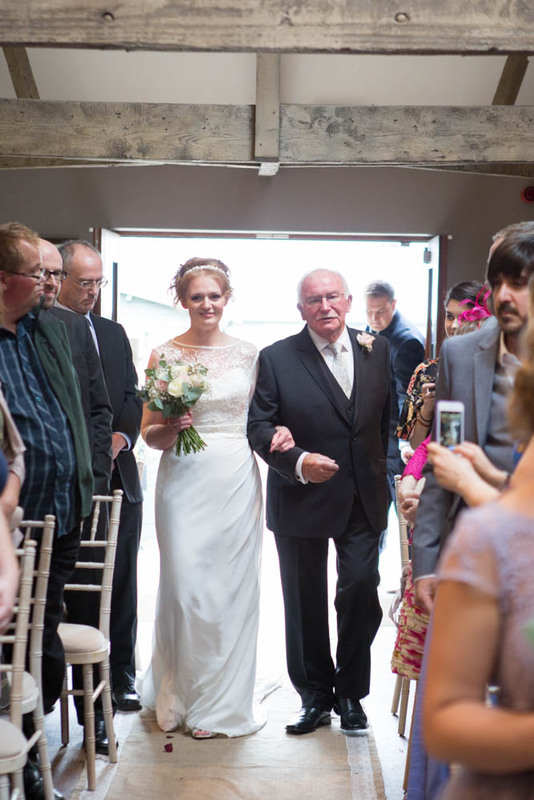 As the song started my ladies disappeared round the corner and down the aisle until it was just me and my Dad left standing outside. Taking a deep breath we started our walk. I made it a few steps into the room with a big smile on my face until my eyes met Simon's and I realised that his bottom lip was wobbling. That was it, I was gone! I had tears pouring down my face and as I more or less ran the rest of the aisle to get to him I was furious at myself for crying. In hindsight I think my family and friends, who know me so well, would have found it odd if I hadn't cried walking down the aisle! Having spent so many years of my life feeling very single and alone i had given up all hope of ever meeting "the one" and here I was, finally about to marry the most amazing man I have ever met. It's no wonder I was feeling emotional. I calmed down as soon as I took Simon's hand and taking a few deep breaths we were ready to begin. 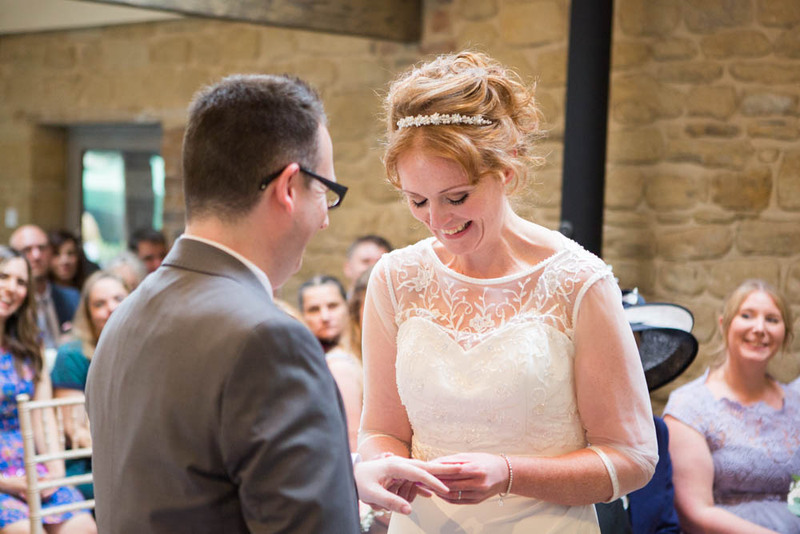 We'd decided to keep our ceremony short and simple, sticking to traditional vows and a couple of readings. During the planning process picking out the perfect readings was very difficult - it's impossible to find anything original and options are so limited. For our first reading I decided to re-write my own version of a popular wedding reading that was read by my friend Sam. I was very thankful when my attempt at comedy paid off and the room filled with laughter! We chose an extract from Winnie the Pooh read by Simon's Goddaughter Faith as our second reading. My Grandma is a huge fan of the AA Milne books and I have some wonderful memories from my childhood of her sharing the stories with me. At 93, Grandma was too old to travel to the wedding so I loved picking a reading that would have meant something to her. After such a shaky start I was so happy that I had managed to calm myself down and was able to enjoy every moment of the ceremony. It's one of the few parts of the day that I remember really well. 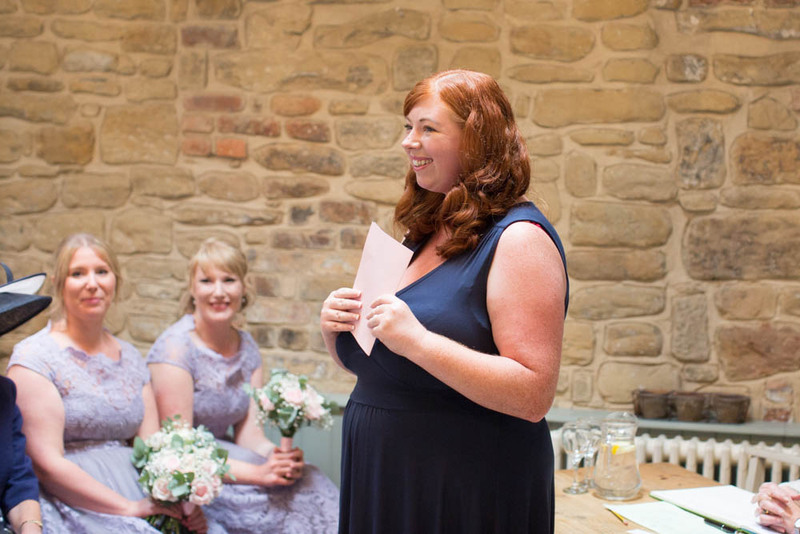 I felt so relaxed and excited to be making our vows in front of our friends and family. In no time at all we had rings on our fingers and were husband and wife. 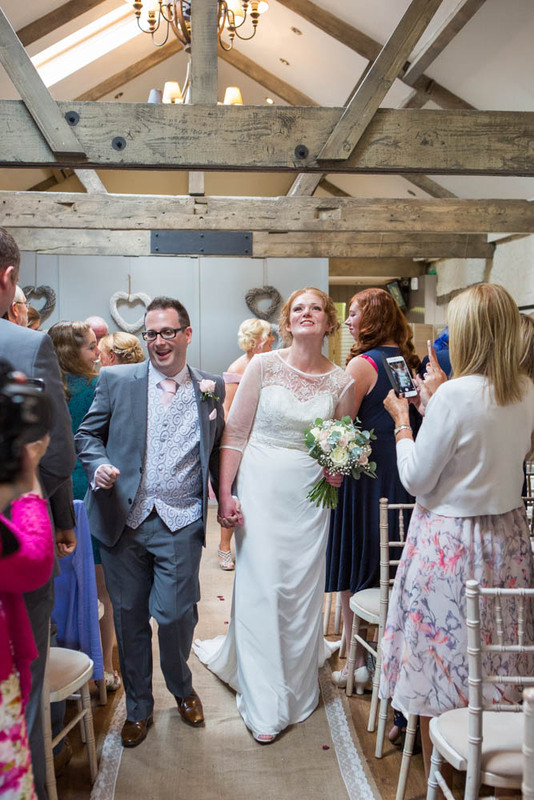 We kissed to applause and after signing the register made our way back up the aisle to Pharrel's "Happy", with Simon dancing towards the exit. A moment that took us all by surprise! With the formalities over, we couldn't wait to spend the whole afternoon of fun and celebrations with our family and friends. Come back tomorrow to read more about our big day. Well I had a little cry!! This is just beautiful, gorgeous venue, stunning bride and I love all the little touches that made it all 'you', those things were my favourite things about planning our wedding ten TEN years ago!! So many congratulations to you both, can't wait for tomorrows bit! Ah thank you so much for allowing me to be part of yours and Simon's special day. It really was such a personal and special ceremony. Ahhhhh!! There we have it ! 😍 Even your blogpost is choking me up Chloe. Such a beautiful venue - I hadn't realised it was a tea room and ice cream parlour. That really is so you, (and me too). Stunning! 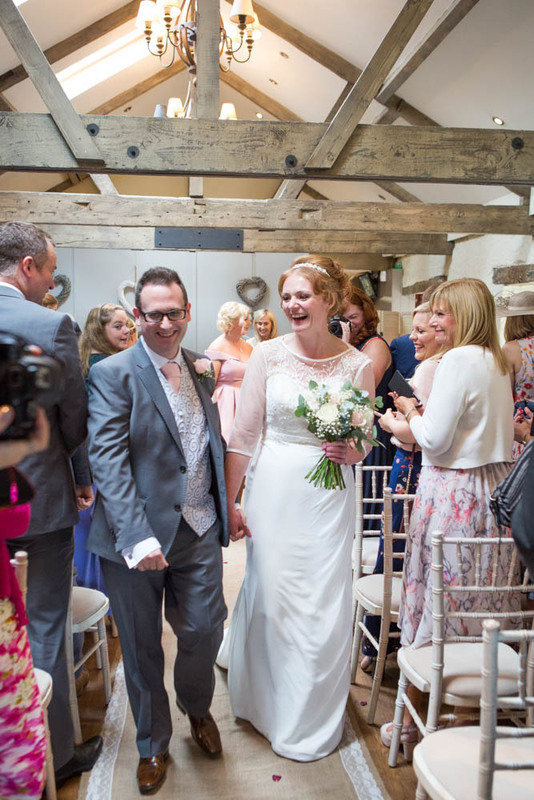 I cant believe you got married in a tea room/ice cream parlour - that might just be the coolest thing I've ever heard! Congratulations! What a beautiful day! I've just read all your wedding posts as I'm excitedly planning my own for this year!